S/Sgt. Pete D. Henderson, son of Mr. and Mrs. Rettie Henderson, graduated from New Mexico State College. 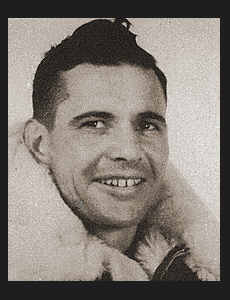 Entered Air Corps in Sept., 1942, trained in Sioux Falls, S. D., Laredo, Texas, Walla Walla, Wash. and great Falls, Mont. ; served in England and Scotland. Awarded DEC, Air Medal with four Oak Leaf Clusters, ETO Ribbon with two Battle Stars, Pres. Unit Citation with one Oak Leaf Cluster, Am. Theatre Ribbon, Good Conduct Medal.